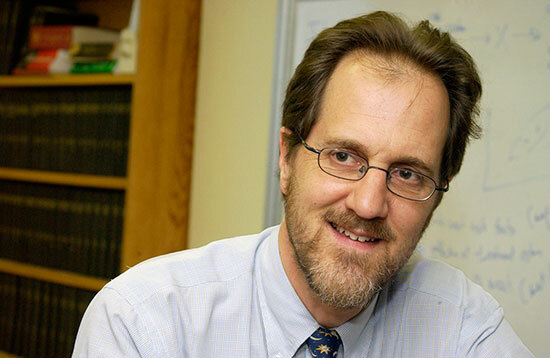 In Overdiagnosed, H. Gilbert Welch (photo), with Lisa M. Schwartz, and Steven Woloshin, explains how the medical profession has an increasing tendency to make diagnosis which is not good for us. The rationale for more diagnosis seems good. When we diagnose more we are able to detect abnormalities, like cancer, high blood pressure, diabetes, high cholesterol, etc., earlier so that we can treat them earlier and prevent serious health problems. An example of this greater emphasis on diagnosis is the prevalence of disease awareness campaigns which encourage people to undergo medical screenings. Another example of increased tendency to diagnose is when doctors have patients tested for things about which they have no complaints. Although more diagnosis may sound good, according to the author it is actually, on balance, not when it leads to overdiagnosis. Overdiagnosis is the detection of abnormalities which are harmless. Overdiagnosis is likely to happen when diagnosis is done when there are no symptoms. What is important to know is that many asymptomatic people have abnormalities of some kind which are no threat for their health and which will never become a threat to their health. Some of these unharmful abnormalities may fall into innocent sounding categories like slight overweight, or pain in the knee, but some unharmful abnormalities involve terribly dangerous sounding words like stroke, cancer, high blood pressure, diabetes, high cholesterol, etc. While all these dangerous sounding words may involve abnormalities which indeed can kill you, in many cases abnormalities like these won't kill you or even harm you. For instance a study found that 10 percent of healthy participants had had strokes (silent strokes) without them being aware of it. Another example is that a large percentage of adults have some evidence of thyroid cancer. For most of them this will never become dangerous because cancers are often static or progress extremely slowly. Some abnormalities are dangerous, many abnormalities aren't. How does the medical profession decide when abnormalities should be considered pathological? 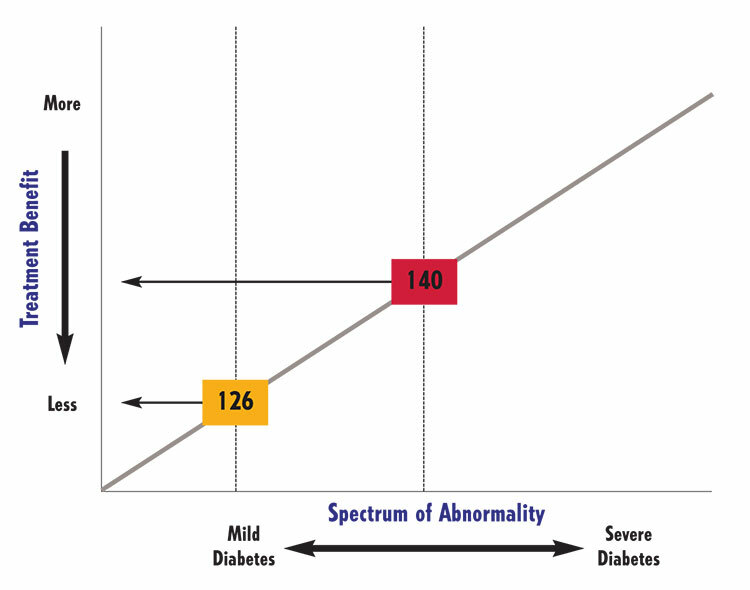 Medical professionals consider an abnormality pathological when the value they find in a diagnosis is above a certain cutoff score. This cutoff score is not something which is purely scientifically established. The distinction between abnormal and normal can be rather arbitrary. The author explains that cutoffs are defined by panels of physicians and they involve not only scientific judgments but also personal values and opinions and financial interests. Cutoffs are also not fixed. They frequently change over time. The direction of this change has been to set cutoffs lower and lower. Due to this, the threshold to make a diagnosis has fallen and the number of individuals who are labeled sick has increased, often dramatically. The picture below (source) illustrates this with the -arbitrary- example of cholesterol level cutoffs. 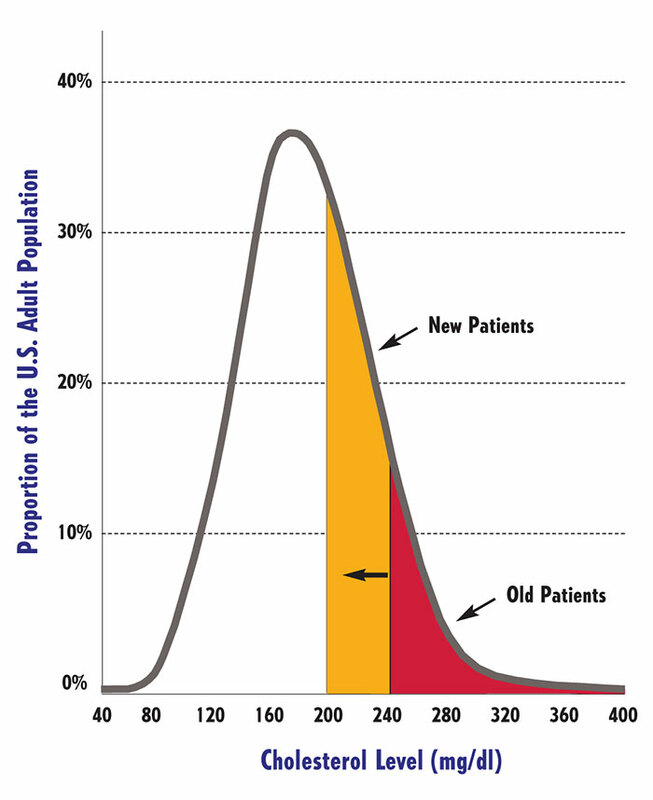 As the picture shows, lowering the cutoff only slightly, creates a great number of new 'patients'. What forces drive the lowering of cutoffs? The author mentions at least three forces driving the lowering of cutoffs. First, there is the true belief by many that early detection is a good thing because it can prevent worse. Second, new technology enables medical professionals to screen more easily, cheaper and more refined. Third, finding more abnormalities and defining these abnormalities more and more as pathological enlarges the medical market which leads to financial benefits. The author explains that this third force is a dangerous one. He says the commercialization of medicine is a corrupting force. It may have been fine if medical care would have been a free market but it is nowhere close to being a free market. Sellers in the medical care market create demand for their wares by being in the position to decide whether or not you need to consume their products. Turning more people into patients is (like) expanding the market, something of which the whole medical-industrial complex financially benefits. Medical research is also negatively affected by commercialization. In order to do research researchers have to apply for grant money. Decisions about grants for research are not only often made by the commercial companies like the pharmaceutical industry (most medical research is now funded by industry) but also by other researchers who are wedded to conventional ideas and approaches. Sympathetic sounding disease awareness campaigns also increasingly involve paid advertising. What is the problem with more diagnosis and lower diagnosis thresholds? More diagnosis and lower thresholds lead to more treatments. A cycle of seeing more, finding more, and doing more emerges. People with small abnormalities will be treated more than was the case before. There are two problems with this. First, people with milder abnormalities stand to benefit less from treatment than those with severe abnormalities. A few may be helped but many will be overdiagnosed and some of them will be harmed and no one knows who. The following picture (source) shows the relationship between treatment benefit and level of abnormality. Second, being diagnosed and being treated has some serious disadvantages. There are potential psychological (for example viewing oneself as a patient), practical (for example not being admitted to insurance), financial (for example spending more on healthcare) and medical harms (for example side effects, sometimes very serious, even life threatening) of being diagnosed and treated. When patients have seriously threatening abnormalities there is often little that can be done about these harms. In those cases treatment is necessary and its benefits outweigh the negative effects of being diagnosed and treated. But for patient with mild abnormalities chances are that negative effects of being diagnosed and treated outweigh its medical benefits. This book is not a criticism against conventional health care. It does not advocate alternative healthcare. It is also not against diagnosis and treatment. On the contrary, the author is all for conventional healthcare and urges people with symptoms to talk to their doctor. It is diagnosis and treatment in the absense of symptoms the author warns against. Often, it is wise to remember: if it ain't broken, don't fix it.